Yesterday, March 19th, was St. Joseph’s feast day. And every year, we forget to celebrate. Maybe it’s because it’s Lent? Maybe it’s because St. Patrick’s Day comes just two days before. Even though it’s not as important a feast as St. Joseph’s Day, it seems to overshadow it because St. Patrick’s Day is a big deal culturally for Americans (because so many of us are descended from Irish immigrants) while St. Joseph’s Day isn’t. And our St. Patrick’s Day celebrations are usually solid. I found a gluten-free Irish Soda Bread recipe I like and this year I tried making Corned Beef for the first time. We added collards from our garden instead of cabbage and it was delicious. I even picked up a Shamrock and some gluten-free chocolate and peppermint cupcakes at Trader Joe’s and the kids thought I had been swapped with the kind of fun mom who let’s you have bright-colored desserts. “Wait….we CAN buy those green cupcakes? Like we’re really buying them? I can put them in the cart?” Live it up, kids. Mean mom will be back soon. Anyhow, we’ve got a favorite St. Patrick picture book to read and a St. Patrick’s Day groove. But, St. Joseph’s Day? Not so much. And the truth is, with all the ideas about liturgical celebrations floating around the internet, sometimes I get overwhelmed before I begin. Because whatever I’m going to pull off won’t be as pretty as so-and-so’s. Or because I don’t have the supplies for all ten crafty activities that what’s-her-name is doing with her kids. So I just give up. But it doesn’t have to be like that. It can be simple. It can be relaxed. It can be YOUR celebration, not somebody else’s. Just picking one special thing to do isn’t just good enough, it’s great. So THIS YEAR, I decided we would start a tradition for St. Joseph, even if it wouldn’t be perfect. 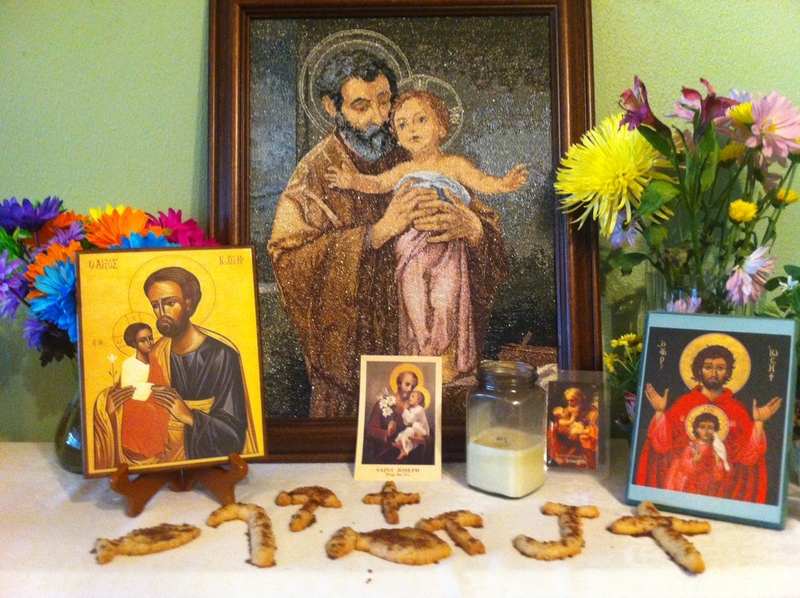 I read about St. Joseph’s Day Altars when I was researching resources for my March Liturgical Living post. It’s a very popular tradition in Sicily and is also alive and well in New Orleans where my husband grew up. 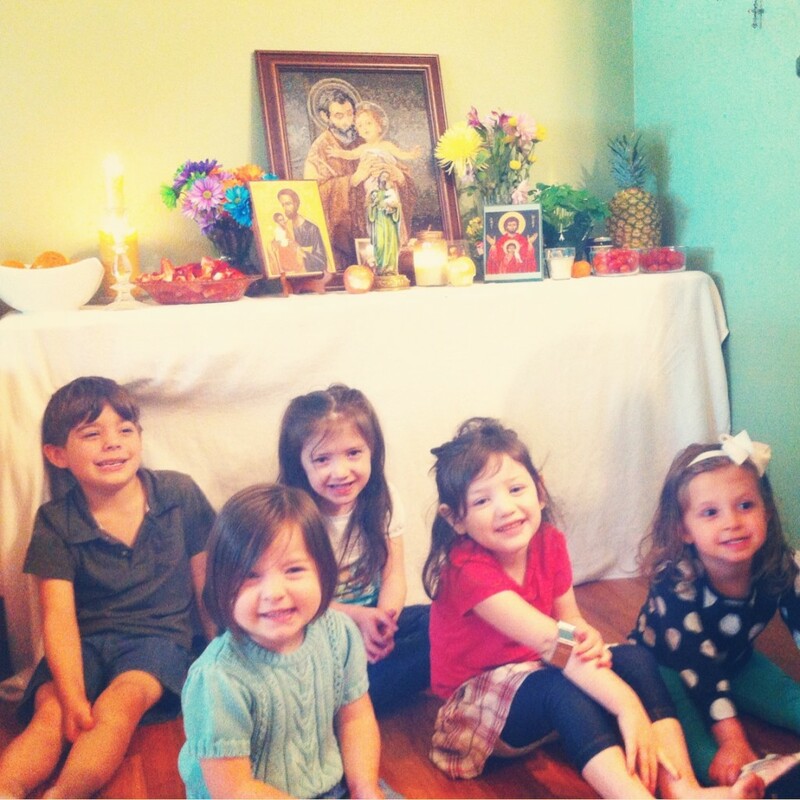 I threw out the idea to combine a St. Joseph’s Day Altar party with the weekly playdate of Catholic moms and they were all for it. So, since my house was 60% clean, I offered to host and the night before we discussed a few ideas about what each of us would bring. Because helping our children participate in the Christian Year and learn about our Faith is the real goal here, we tried to engage them as much as possible. My friend Kaitlin brought St. Joseph coloring pages and read the kids St. Joseph’s Story. 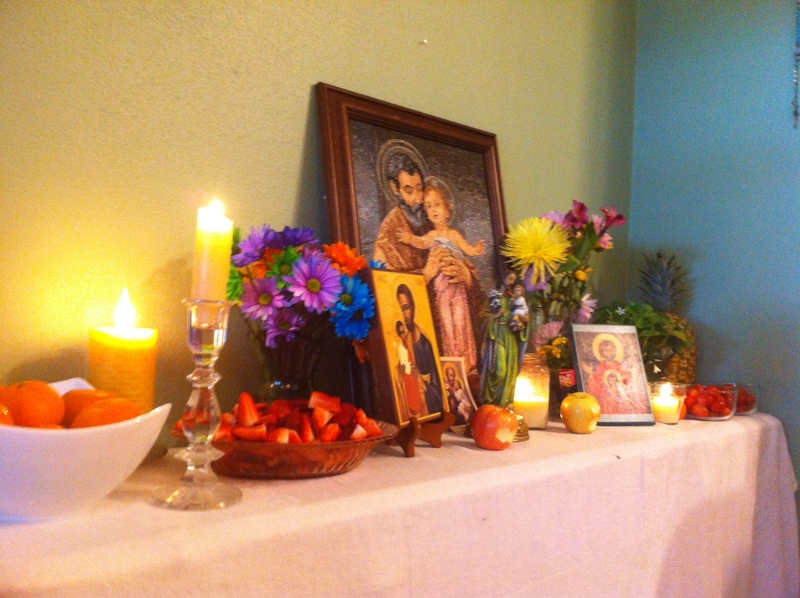 Then the kids lined up and each had a chance to place the fruit, candles, and icons on the altar. A pineapple, a shamrock from St. Patrick’s Day, rainbow carnations, a bowl of cherry tomatoes, oranges, strawberries…it wasn’t perfectly authentic with our mishmash of items, but it turned out beautiful! So don’t be discouraged or overwhelmed. Don’t feel like you have to celebrate every saint’s day or celebrate just like someone else’s family. Just jump in and share your love for your faith, however that looks for you. That’s what your kids will remember. 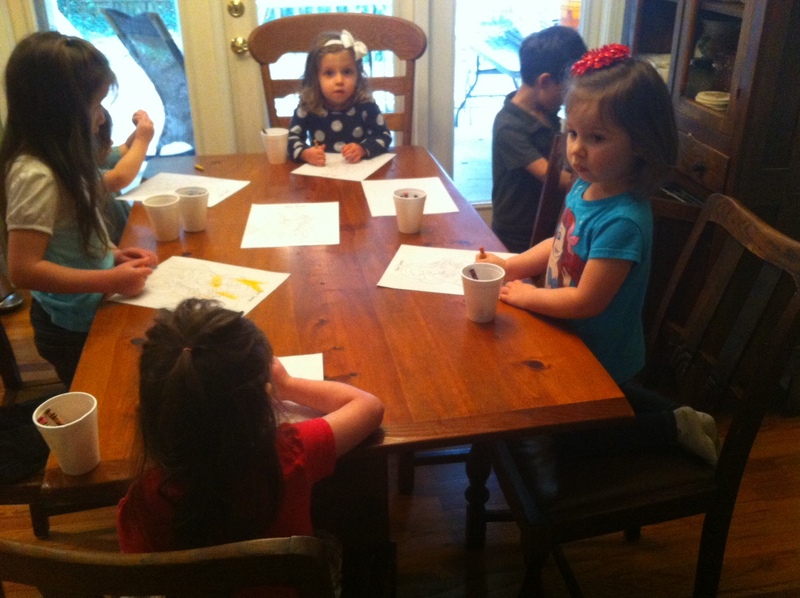 Not how well your crafty activity turned out or how perfectly decorated the cupcakes were. Being with you, learning about faith together. That’s what matters. The kids were so proud of their altar and had a great time! I hope it’s something they will always remember and will be excited to do again next year with Kaitlin, Jeni, and Neely‘s little ones! And in case you were wondering if our feasting ever flops…. 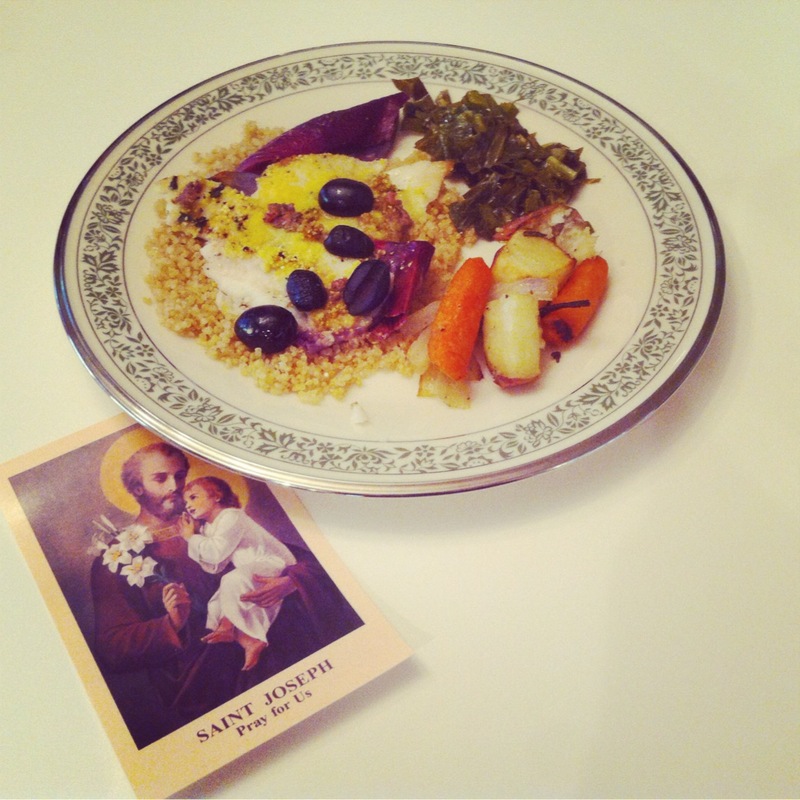 This Sicilian Baked Fish recipe I made for St. Joseph’s Day dinner? Nope. Not making it into the next cookbook. Just. Not. Good. Remind that I don’t want to see the phrase “anchovy paste” in a recipe ever again. 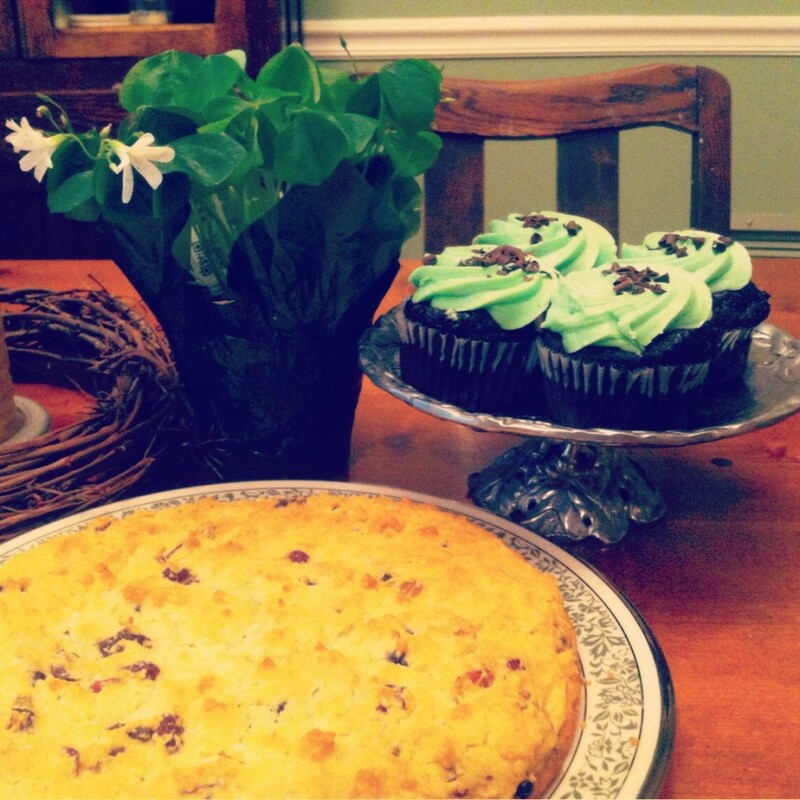 Did anyone do something special for St. Joseph’s Day or have family traditions to share? Does anyone else get overwhelmed with all the things you COULD do to observe the Christian Year? 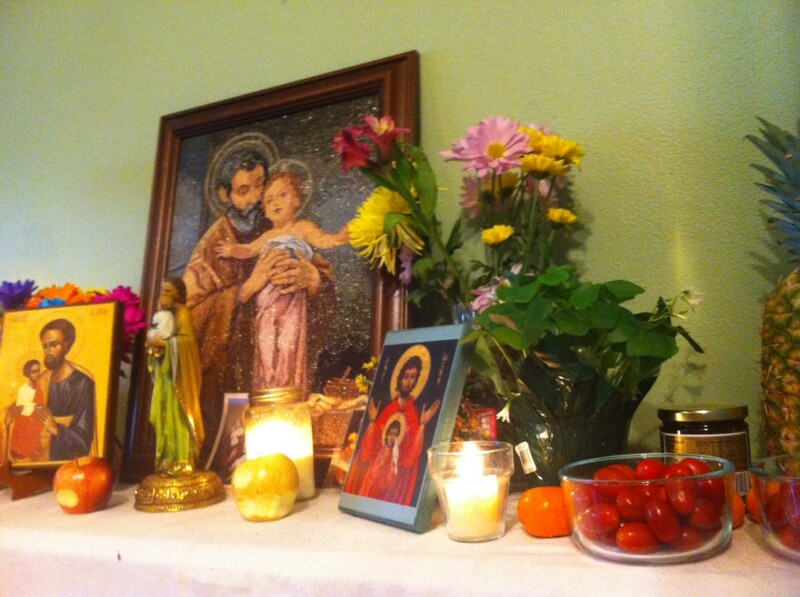 I set up a simple St. Joseph’s altar last year, but this year, like you said, the feast kind of snuck up on me. It was the morning of when I decided I wanted to do something to mark the feast of my husband and son’s patron but hadn’t planned anything and we would be gone most of the day. Ultimately, I moved make your own pizza night (that’s Italian!) up a couple of days on the meal plan, we said a prayer next to the St. Joseph picture in my son’s room, and read Song of the Swallows. I figured it was enough. Then in a stroke of genius, I suggested my husband take my son out to the garage to work with some wood, which is one of his pastimes anyway. Father-son bonding, a liturgical year activity, and some down time for me! Nice! I remembered on Tuesday night, so we had (gluten-free) pasta con sarde, without the traditional breadcrumbs. I’m going to have to check out that soda bread recipe. I’ve been looking for one that actually tastes good. I liked this one! I didn’t have much GF flour, so I used half GF bisquick and I added a little xanthum gum. You and I have different definitions of simple. I made some noodles and we said a quick prayer. I love the way you got the childrenfolk involved with it though. That’s awesome. Love your celebration photos, I’d love for you to link up with me tomorrow or anytime during the week for my .I host a link-up every Saturday thru Friday night. Hope you’ll check it out! God Bless you and your sweet family! Thanks! I’ll try to remember! I’m the worst about forgetting to link up! oh yey! I love this post. BTW, I have a candid shot of little Lucy with one of those apples hehe. I love your message here. Thankfully, our parish hosted a massive St. Joseph alter, mass, and big dinner. It was fabulous. So on the actual day, we had coloring pages and a treat for my son’s name day and that was it. That sounds wonderful! I am so lucky to have some amazing Catholic women to share life with. St. Joseph’s Day totally fell off my radar this year. One thing I’d love to do next year is find a way to celebrate my husband on that day. He’s such a great husband and dad … he deserves it. Love your altar, by the way.